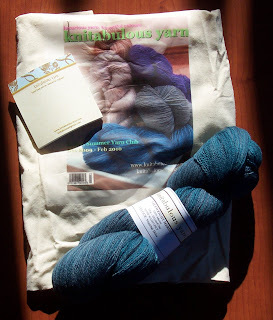 I have a busy little knitter of late, so I have some nice little finished objects to show you. Ta da. Finally these socks are done! 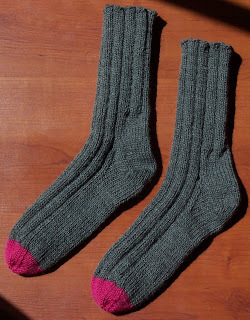 I promised several years ago, that I would knit a friend of the family a pair of socks. Started early last year, and finished early this year, this is probably the longest time it has ever taken me to knit a pair of socks. Despite the fact that the wool was 8 ply and knitted on 4mm needles, and therefore should have been a quick and easy knit, I couldn't seem to get into the swing of things with these, and kept on getting distracted with other projects. I really enjoyed trying out this particular pattern, and will probably use it again. 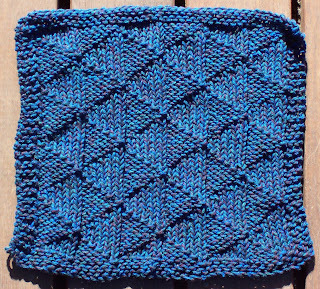 Considering the wear and tear on dishcloths around here, if it lasts longer than a few months, then the pattern is definitely a keeper! In my other spare time, I have been working on stash accumulation - not that I really need more sock yarn of course, but I can't resist all those pretty colours. Also I've discovered that Sanguine Gryphon is a lot easier to stalk than Wollmeise, so I've managed to score quite a bit of yarn in their updates. Also the last installment of the Lush Summer Sock Club - check out the pretty blue yarn. I've already signed up for the Autumn installment of this one too, so I can keep on getting my hands on the goodies. Visiting from your comment on DrK's blog. Working on stash accumulation? That's something which I find easy to do, no hard work there at all. I loved Ailsa's Indian Summer and am looking forward to the next selection from her. Lovely yarn, beautiful colours from her. I'm with you about some projects taking longer than they should. Can't fathom why and others fly off the needles, even quite large ones. Those socks look cosy.